Mahogany finish on wood construction has an elegant style. Compact design folds quickly and easily for storing when not being used. 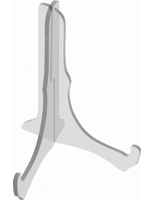 1-1/4" Pegs are strong enough to hold items up to 1 lb. in weight. 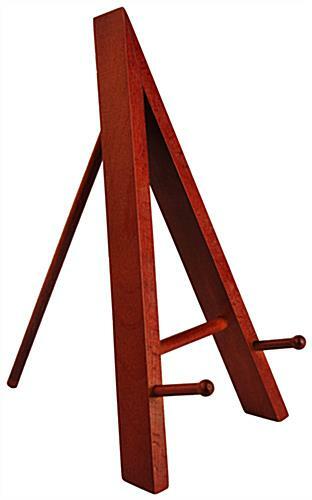 These table top easels are wooden stands that are meant for use on countertops, mantels, and shelves. Each art display features a quality construction designed to exhibit an item for years. 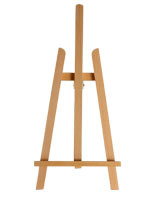 Table top easels for small canvases have a 1-1/4" pegs to hold a variety of items such as souvenir plates, pictures, books, a painting, and more. The art cannot weigh more than 1 lb. 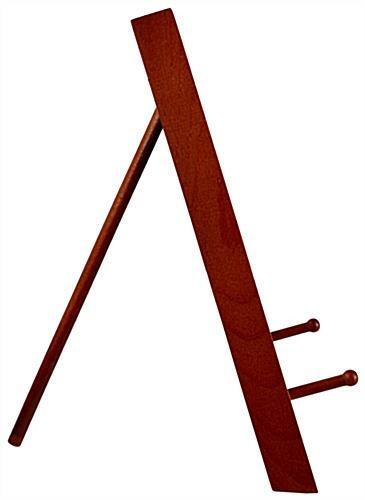 These wooden stands are table top easels that are for businesses as well as home or office use. This painting display is often found on tables at book signings, at events holding a portfolio on a company, and in an office with a custom plate or picture frame. 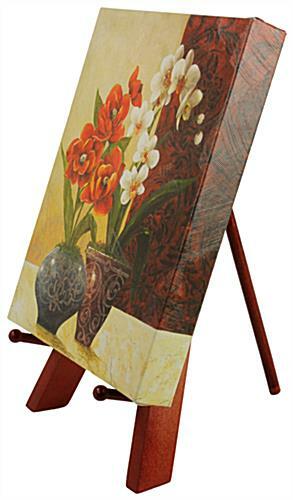 Table top easels are inexpensive and make a great gift when paired with a painting or photo to display. 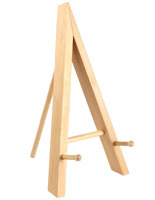 This small wooden tripod stand folds down to just 2-1/4" thick which is ideal for storing and traveling to different events. 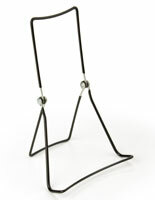 These art stands are table top easels that are fully assembled to save customers time and frustration. Just unpack this painting display and it is ready to hold a book. 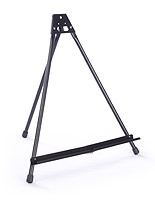 In addition, these table top easels are lightweight for portability. 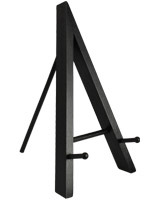 Many businesses use these stands at trade shows for exhibiting information since they are such a great size and never need to be unassembled. 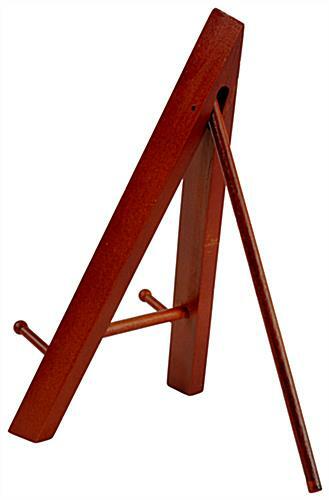 These painting holders are table top easels that are mahogany. The rich color is elegant for any setting and is a great alternative to black or natural wood. 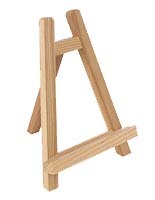 Table top easels are used every day in many industries. 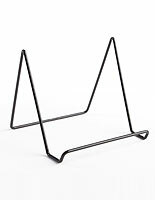 Any retail store can benefit from the use of these stands on the counter whether to display small boxed impulse items, or to advertise for sales. These wooden holders are available for purchase in bulk quantities at a discount. 5.3" x 9.4" x 6.8"
5.3" x 10.1" x 2.3"
85% of the shipment was accurate and the product was received in individual boxes. Since each box contained a specified amount, the displays were kept in their boxes. There were 2 leftover and they were wrapped in bubblewrap and placed with the boxes. The problem is that they were not the same color. In addition, one of the easels in the smaller box had one of the pegs damaged. After reading their return policy, I decided not to pack up the 3 easels in one big box. I also decided the cost to return was not worth it. We are sorry that your order arrived damaged and not as described, Kristen. A customer service representative will reach out to you shortly.